Ultra powerful adhesive of MS-POLYMER technology. In many applications it substitutes screws and nails for numerous materials. It has exceptionally powerful adhesion on porous and non porous surfaces, even without primer, on similar and dissimilar materials. 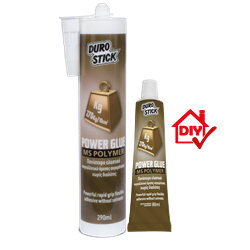 Ideal for unbreakable adhesion with excellent initial grip in construction, industry and shipbuilding. Indispensable tool for plumbers, electricians, refrigeration technicians and other specialists, but also for those involved in repairs and tough jobs at home. Use it to install mailboxes, shelves, hooks and bathroom accessories as well as toilet bowls etc. Simultaneously seals and waterproofs cracks and joints. Suitable for indoor and outdoor use.